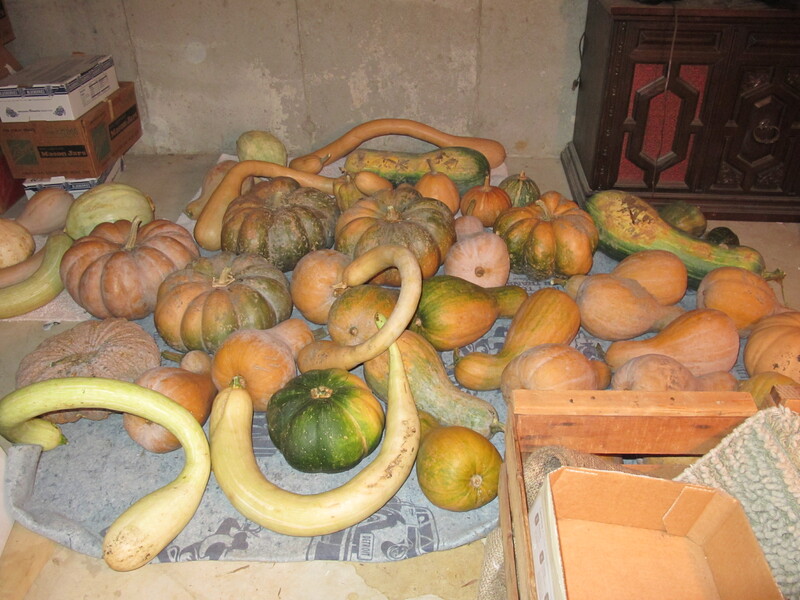 When all was said and done, this year’s [winter] squash harvest topped 800 pounds. That’s a lot of squash. This picture shows the portion that Matthew harvested fully ripe. We have this much again that should ripen and be good for eating down the road (though perhaps a bit less flavorful than the fully vine-ripened). We also sold a total of 250 pounds of the squash harvest to Local Harvest Grocery and Five Bistro, so if you want a taste . . . . The remaining squash leaves us with a decent bit to use throughout the next several months. Fortunately, we like squash, and it’s really quite versatile: roasted and served as a savory or sweet side dish; cooked and pureed to make soup, custard, or pumpkin bread; cubed or diced and used in place of carrots in soups, stews, and other one-dish meals. And don’t forget chocolate pumpkin cake! With the cooler temps, I’m really enjoying excuses to turn on the oven (a complete one-eighty from my summer behavior of avoiding it at all costs). If the oven will be on anyway, roasting a squash is an easy way to make use of the heat, since they can cook at whatever temperature you’re using for other recipes, as long as it’s in the 350°-450°F range. Coconut oil is the secret ingredient. Grab a squash, slice it, rub the slices with coconut oil, and sprinkle with salt if desired. Lay slices flat in a single layer on a rimmed baking tray. Bake for 15-25 minutes (depending on thickness of slices) at 350°-450°F, then flip each slice and bake for 10-20 additional minutes, until they reach desired tenderness. Serve as is, or dress up with spices and herbs of your choice.